“Involving individuals from a variety of disciplines, from health care to transportation, allows us to take an inclusive approach to improving Delawareans’ health." 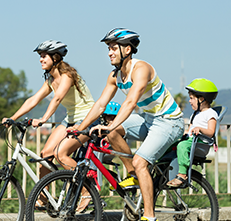 DPH’s Physical Activity, Nutrition, and Obesity Prevention (PANO) program is a member of the coalition—and provides technical assistance to support a range of obesity prevention initiatives in Delaware. “Involving individuals from a variety of disciplines, from health care to transportation, allows us to take an inclusive approach to improving Delawareans’ health,” says Dr. Karyl Rattay, Director of DPH. “We follow a social-ecological model,” adds Laura Saperstein, who manages the PANO program. That means DPH supports efforts like building “complete communities” (communities with walking and biking options), increasing opportunities for physical activity at schools and work sites, and educating individuals on healthier habits, in an effort to decrease overweight and obesity in Delaware. One ongoing effort involves a dynamic and interdependent model for funding healthy weight activities in Delaware. Former Governor Jack Markell convened the Delaware Council on Health Promotion and Disease Prevention (CHPDP) in 2010 to help with the fight against obesity.5 CHPDP created an online “clubhouse”—a portal where residents can log their healthy activities. When residents log miles (for walking, biking, or other activities), they earn points, or “kudos.” And thanks to donations from the private sector, these kudos then fund wellness programs at local nonprofit organizations. “It gets adults to exercise and it moves money to local organizations, which then offer related programs,” Saperstein explains. The name of the initiative? Motivate the First State. And it does! One of the participating organizations is the YMCA of Delaware, which uses the funds to offer Healthy Weight and Your Child, an evidence-based program where families get active and learn healthy habits together. There are about 30 people in each 15-week session, and the YMCA has already completed several sessions. Members of the initiative are now reaching out to other counties and towns to communicate the importance of including health equity considerations in their comprehensive plans. In another effort, DPH partnered with the University of Delaware’s Institute for Public Administration to create the Toolkit for a Healthy Delaware. It offers resources for local governments to assess—and work to improve—their towns’ opportunities for physical activity and access to healthy foods and environments. 6 Data provided by the PANO program.